Even before my children start their annual greed lists, my wife begins a months-long odyssey of creating the perfect family image to send to loved ones at Christmas. What some people dismiss as an antiquated practice involving such archaic institutions as the U.S. Postal Service, sending Christmas cards is the apogee of the season for Carla, who cannot fully enjoy Christmas until the refrigerator of every person we know is adorned with a unique artistic rendering of our family. 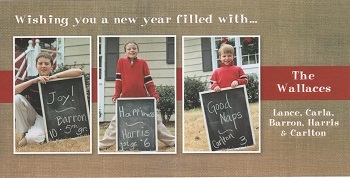 The 2011 Wallace Family Christmas Card. For the record, Carlton is helping his smile a bit by pushing up his cheeks, a tactic I frequently employed at his age. Oh, to be one of those lucky families whose self-appointed public relations manager simply goes to one of those new-fangled websites, uploads a family photo from the past year into a template, electronically transfers a few dollars from their credit card and is finished with another year of sending Christmas cards. Yes, Carla does all the work, but having to offer feedback on her designs is like a bad trip to the optometrist. I take some comfort in knowing that when British businessman Sir Henry Cole sent the first Christmas card in 1843 adorned with an image of a family offering a toast around a table, it was roundly criticized for promoting drunkenness. See! People have been making bad decisions with their Christmas card designs from the very beginning. This should take some of the pressure off us, shouldn’t it? Despite all the customization we go through each year, there really is a method to our madness. We rotate annually between a family portrait and a shot of just the boys. Personally, I’m ready to cede every year to the boys, who for now, seem to be growing in cuteness while we just look older each year. The boys' wishes were written in their own hand... well, except Carlton. His would have just been scribbles. “Carlton, what do you want to wish everyone? Wishing you a new year filled with… what?” Carla asked. “Good what?” she asked, hoping to elicit something more grammatically correct. There are nine days until Christmas. Almost all the shopping is done. The kids are on their last school day of the year, and I’m prepping for two weeks of Christmas vacation myself. We’ve been to numerous parties, spent time with friends, experienced meaningful worship and enjoyed family traditions that make this season so special. I am most happy to report that the Wallace family Christmas card is done and on the way to you or, better yet, already on your mantel or other place of honor. Whether or not it conveys the message we wanted or portrays our family in the best light, it’s done. Now I can have at least six weeks before I have start giving my opinion on what next year’s Christmas card needs to look like. Think I’ll get started on those good naps. Do you send Christmas cards? What’s your process? Do you do photo cards? How do you choose your message? Do you still do a Christmas letter? Leave your comment below and share your pain with us. This Christmas therapy is free! This entry was posted in Uncategorized and tagged Barron, Carla, Carlton, chalkboard, Christmas, Christmas cards, contemporary South, good naps, Harris, Lance Elliott Wallace, Lance Wallace, New South, New South Essays, NewSouth, parenting, photo cards, South, Southern, Southern Culture, Southern Living, Southerners, the South. Bookmark the permalink. Sounds like you have it good. We had to send Christmas pictures in every Christmas letter and it was like World War III getting me and my sister both smiling at the same time. I had to chuckle when I read this post. My mother sent out picture Christmas cards almost every year and we came up with some funny cards. The one in our pajamas, the one of our pictures (because I’m guessing she couldn’t get a good picture), the one with the neighborhood donkey and the one with the family monkey were just a few! I kept the tradition and have sent picture cards for 26 years! The dreaded Christmas card picture takes began before Thanksgiving! Now, my girls are sending their own picture cards! Traditions – gotta love them! I’m with Carlton on the naps! We still send Christmas cards, mainly to old friends from the past. We got our card yesterday and I must admit I look forward to opening it every year. I swear Carla is a kindred spirit and I would relish the composition conversations of which you speak. We aren’t mailing cards this year (for various and sundry reasons) and it is KILLING me. Glad to read this post. I have been waiting for an essay on the south’s approach to the Christmas card. You did not disappoint!